This unit has 7 inch touch screen, which supports 1080p HD video. It is compatible with the original car. You can use steering wheel control buttons with it freely. Let’s check out the great functions in it. The GPS navigation system in this Suzuki Jimny car stereo supports 3D maps. After you had a GPS map installed in the unit, you can locate your position at any time. Once you set a route, the map will show you the round to the destination. Some maps can re-plan new routes for you if you drive off the route you had set before now. You will get a lot of help from this function. It comes with USB port and SD card slot. You can use USB flash disk and SD card to copy files from the head unit, or to play videos, songs and pictures in the head unit. It supports WMA/MPEG1/MPEG2/MPEG3/MPEG4/MOV/AVI/DIVX/MP4 etc. You can use a SD card to download upgraded versions of software in computers and upgrade them in this unit, too. It supports IPod and IPhone music. After connection, you can check playlists from your device in the head unit’s screen. You can play songs in both the head unit and your device. The radio function in this head unit cannot be missed. It supports radio RDS with high sensitive FM/AM receiving mode. It can grasp the global news and traffic conditions at any time. If you like to keep radio stations, this function supports 30 stations preset. If you have to answer calls often, you may not miss the Bluetooth function. It’s inconvenient to take out your phones during driving with an incoming telegram. You can connect your phone to the head unit by Bluetooth. After connection, you can pick up calls on the dashboard directly. You can read call history, call back, play songs in your phone by this unit, which is as the same as in your phone. There are optional functions in this Suzuki Jimny car stereo, too. 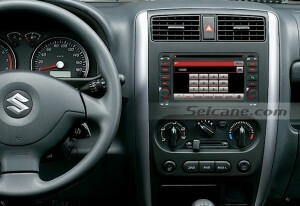 It supports TMC, rearview camera and Digital TV. The rearview function will automatically shift the function interface to rearview video when you reverse the car. The video will show with grids to tell you the distance of the back of your car and other objects. It’s helpful. Please make sure it fits your car and choose all the optional functions you like when placing order. After you get the unit, please check the package carefully to make sure it’s in good condition. Then, please check all the accessories to make sure nothing is missed. Before you install the unit, please ask a professional for help. This unit requires professional installation. Wish you enjoy shopping and like this unit.